A fuller appreciation of the complex mechanisms controlling bone formation by bone marrow-derived mesenchymal stem cells (MSCs) may aid our understanding of the development of diseases such as ankylosing spondylitis and osteoarthritis [1, 2] and permit the elaboration of novel therapeutic approaches. As a step towards this lofty goal, researchers from the laboratory of Huiyong Shen and Yanfeng Wu (Sun Yat‐sen University, Guangzhou, Guangdong, China) analyzed long noncoding RNA (lncRNA) expression profiles during the osteogenic differentiation of BM‐MSC . Now Tang et al. return with a STEM CELLS article  that reveals a novel lncRNA linked to the osteogenesis of BM-MSCs and describes the crucial interaction of this lncRNA with heterogeneous nuclear ribonucleoprotein K (hnRNPK) [5, 6]. Employing customized microarrays, the authors analyzed lncRNA expression profiles in BM-MSCs before and ten days after osteogenic induction, discovering the differential regulation of over a thousand lncRNAs. Of the roughly 300 lncRNAs whose expression rose during osteogenic differentiation, the authors chose to focus on a novel lncRNA, which they christened lncRNA‐OG (gene symbol RP11‐54A9.1). Silencing and overexpression studies in BM-MSCs confirmed the osteogenic influence of lncRNA‐OG, which the authors discovered derived from the ability of lncRNA‐OG to interact with hnRNPK and stabilize its molecular structure and then influence the activation of the bone morphogenetic protein (BMP) signaling pathway. Additionally, the study also established that hnRNPK, either simultaneously or successively, promoted the transcription of lncRNA‐OG by creating a more permissive chromatin environment surrounding promoter regions of the lncRNA locus. Overall, these data describe a novel functional osteogenesis‐associated lncRNA that may represent a valuable target for clinical applications in patients suffering from bone-related diseases such as ankylosing spondylitis and osteoarthritis. 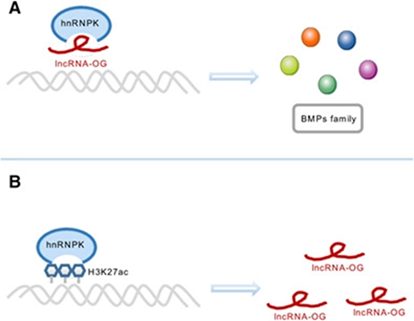 The authors aim to continue their studies of BM-MSC osteogenesis by dissecting the mechanism by which lncRNA‐OG interacts with hnRNPK to regulate downstream genes. For more on the osteogenic potential of BM-MSCs and the crucial role of lncRNAs, stay tuned to the Stem Cells Portal! Do other important osteogenic regulators lie within the ~300 lncRNAs discovered in this study? How does hnRNPK regulate downstream genes? What influence do lncRNAs have in the differentiation of BM-MSCs down other lineages and can we use them for the efficient production of useful cell types? Xie Z, Wang P, Li Y, et al., Imbalance Between Bone Morphogenetic Protein 2 and Noggin Induces Abnormal Osteogenic Differentiation of Mesenchymal Stem Cells in Ankylosing Spondylitis. Arthritis & Rheumatology 2016;68:430-440. Lian W-S, Wu R-W, Lee MS, et al., Subchondral mesenchymal stem cells from osteoarthritic knees display high osteogenic differentiation capacity through microRNA-29a regulation of HDAC4. Journal of Molecular Medicine 2017;95:1327-1340. Xie Z, Li J, Wang P, et al., Differential Expression Profiles of Long Noncoding RNA and mRNA of Osteogenically Differentiated Mesenchymal Stem Cells in Ankylosing Spondylitis. Journal of Rheumatology 2016;43:1523-1531. Tang Sa, Xie Z, Wang P, et al., LncRNA-OG Promotes the Osteogenic Differentiation of Bone Marrow-Derived Mesenchymal Stem Cells Under the Regulation of hnRNPK. STEM CELLS 2019;37:270-283. Klimek-Tomczak K, Wyrwicz LS, Jain S, et al., Characterization of hnRNP K Protein–RNA Interactions. Journal of Molecular Biology 2004;342:1131-1141. Bomsztyk K, Denisenko O, and Ostrowski J, hnRNP K: One protein multiple processes. Bioessays 2004;26:629-638.